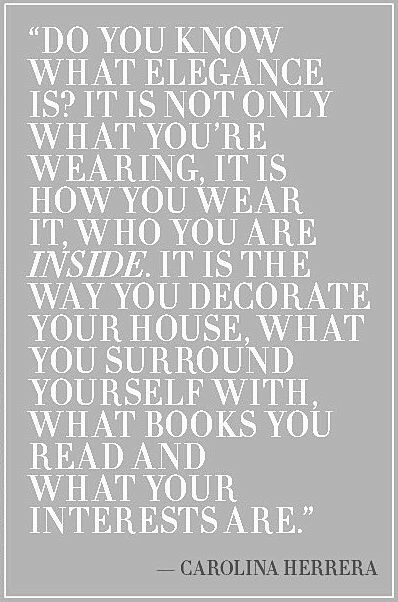 I love this quote from the fantastic fashion designer Carolina Herrera. The weekend is a perfect time to maybe spend some time alone and reflect upon what elegance is to you. What defines you? Are you satisfied with your house, otherwise take some time to move around furnitures, buy something new or declutter it from things that takes energy. Clean out the closet, the clothes you never wear, it makes wonders for the energies. (Give them to someone who needs them.) Think about what books or magazines actually inspire you, we don´t have time to read things that don´t. This is what I´m going to do this weekend. And have a Body combat class, and cook great food, and drink wine, and meet up with friends, and cherish my family. I hope you have a wonderful weekend! Wonderful thoughts to ponder this weekend, I am going to a Broadway Under THe Stars Fundraiser for Charity, and having wine too my friend! Me too .....clean things out. Such a good idea. Such a wonderful quote!! Elegance for me is all of these things, plus how I conduct myself and how I treat others. Lovely thoughts to ponder going into the weekend. Sounds like a perfect weekend Caroline! I always love a little 'clean out' therapy myself.